While steak might be the star of the show at most barbecues, it's hard to overstate just how delicious a good pork chop can be. When cooked right and seasoned properly, this humble cut of pork really stands out among the rest of your typical cookout fare. The only problem here is that most people don't know how to do one or both of those prerequisites for perfect pork. More often than not they've cooked the interior to a bright white as dry as can be or they've barely even remembered to salt their food before cooking; either way, it's going to turn out subpar. 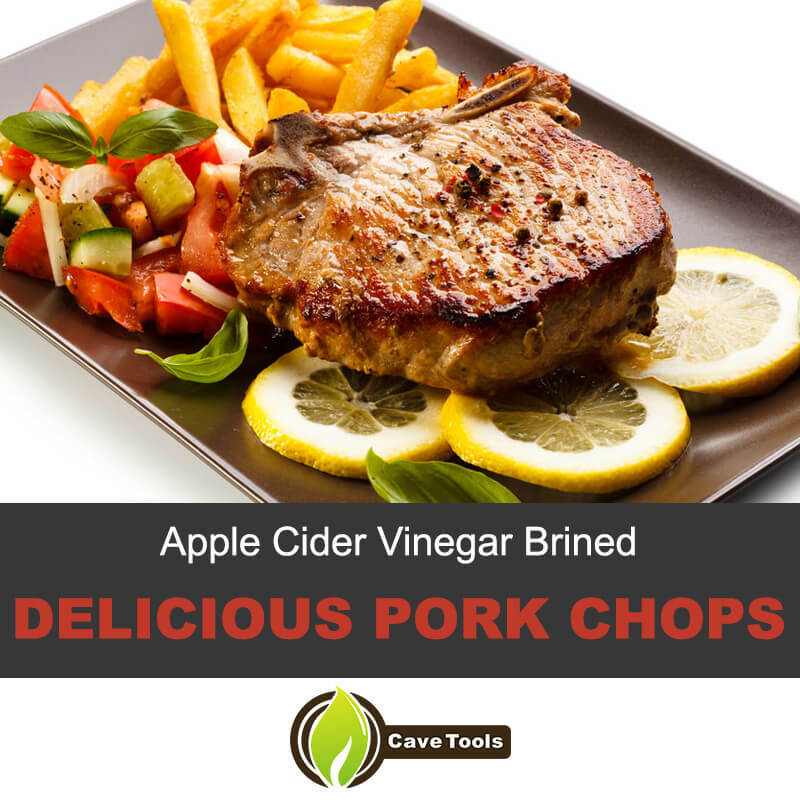 To stop this from happening, let's take a look at a recipe for delicious pork chops cooked with apple cider vinegar brine, ensuring a moist, tender, and flavor-packed taste experience that'll have people talking about your barbecue for years to come. Before you start work on this recipe, you'll need to grab a few ingredients and supplies first. This shouldn't be too hard, though, as there's no outlandish or expensive material used with these pork chops. 1/4 cup barbecue sauce + more for serving. 2 tablespoons red pepper flakes. Large plastic or metal bucket/container with cover. Bamboo skewers (6 or more). When you've managed to collect all your supplies, you can finally begin work on the recipe. The secret to the best barbecue recipes is a good brine. For this, we'll be combining all of the dry ingredients (sans rosemary) with the water and apple cider vinegar in your large container, stirring well to combine. To streamline the process, you can also boil the mixture together to help dissolve everything before cooling. Add in your ice, then your pork chops. Cover and store in a cool place. If it's already very cold where you are, you can even sub out the ice for one additional cup of water for the same results. Allow the meat to brine at least four hours and up to overnight. After brining has finished, remove your pork chops from the water and dry them thoroughly with paper towels. Discard any additional brining liquid. Given that the meat has been absorbing the flavored brine for the last several hours, you won't need any additional seasoning on the outside of the meat. Soak your bamboo skewers in hot water as you go about prepping your grill. For this operation, you'll want to create a two-zone fire with direct and indirect heating options. To do this, line up your charcoal on only one half of the grill and light it, keeping the other half devoid of fire in order to leave it cooler. You can also do this on a gas grill by leaving half the burners turned off as you cook. Skewer your pork chops four at a time with two skewers each, lining them up so they have roughly half an inch of space between them and are all turned in the same direction (i.e. you can stand them up on their bones). Make two or three cuts through the thick fat cap on the top edge of each chop to prevent curling during cooking, slicing with a sharp knife until you just touch the meat. When the fire has had a chance to get hot, place your pork chops onto indirect heat standing up on their bones before covering with the lid. 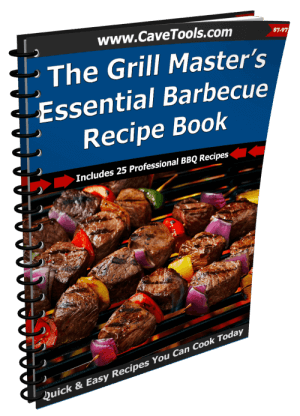 For most average sized grills, about one set of four chops at a time usually works well, though you can certainly do more if your grill has the necessary space. Cook them until they reach an internal temperature of around 115 degrees Fahrenheit. This could take around eight to fifteen minutes or so depending on how hot your fire is and several other factors. Once your pork chops reach that temperature, remove them from the skewers and place them over direct heat. Using your rosemary sprig, "paint" over the chops with your favorite barbecue sauce and let them cook for about two minutes before flipping to the opposite side. Repeat this process several times to build up a caramelized exterior on the pork chops, making sure to turn frequently to avoid burning the sauce. Your pork is fully cooked and ready to eat when it reaches 145 degrees Fahrenheit. After reaching the correct temperature, remove your pork chops from the heat and allow them to rest under aluminum foil for around five minutes. During this time, the meat will relax and reabsorb some of its juices as well as finish cooking as the residual heat distributes throughout. 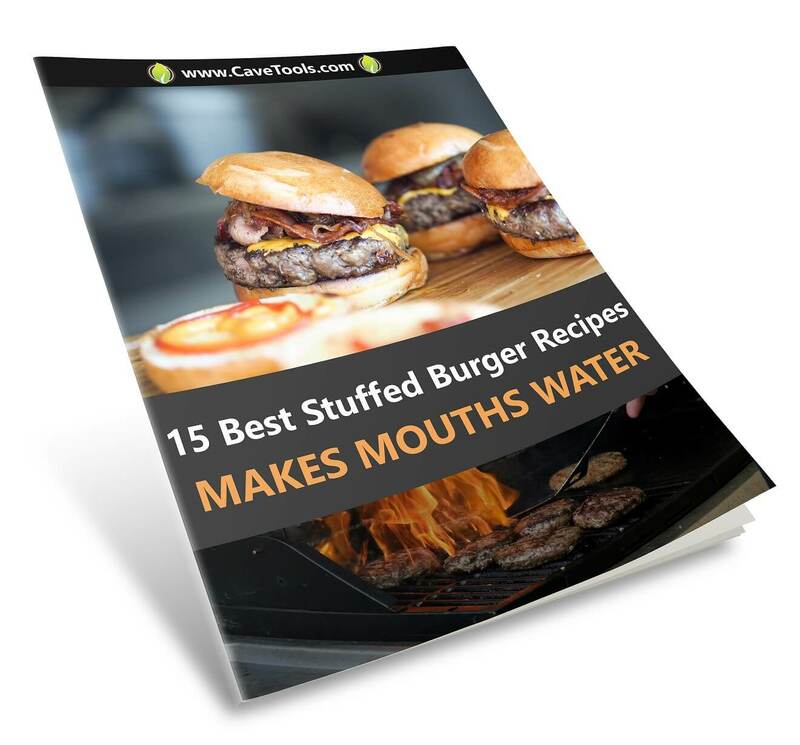 While it may be tempting, allowing it to rest results in an overall better bite of meat that's also cooled down enough to not burn your mouth. When your pork has had a chance to rest, it's finally time to eat. Hit it with an extra coat of barbecue sauce before serving up next to your favorite barbecue sides. 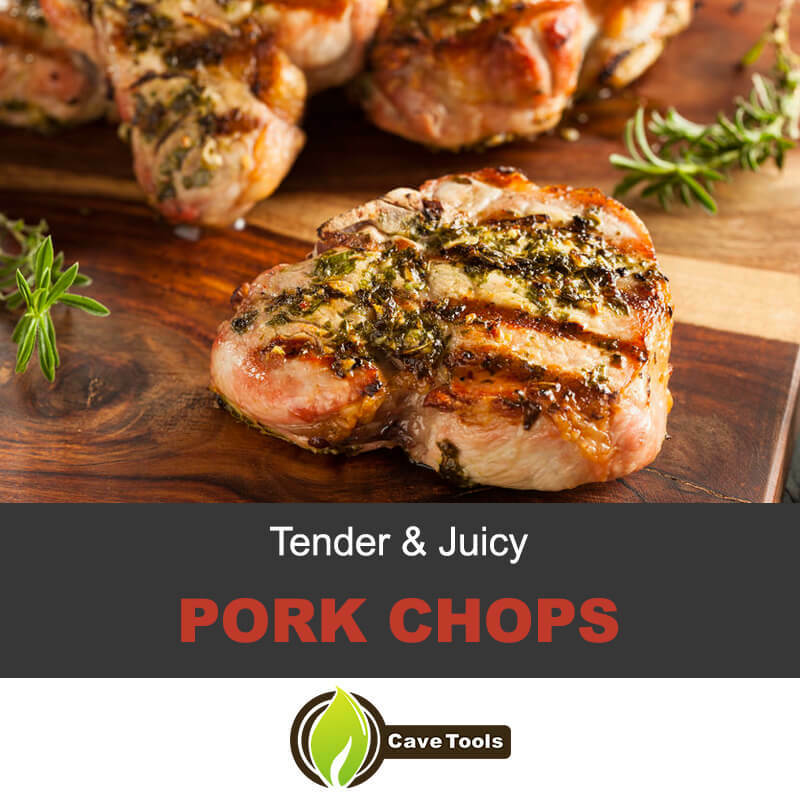 Rejoice as you're treated to a flavor sensation that's completely out of this world as you enjoy tender, juicy pork chops that aren't overcooked with seasoning that brings out every facet of their natural deliciousness. If you've ever wondered why your pork chops turn out so bland and tough, here's the perfect guide for ensuring that doesn't happen anymore. Now you've got everything you'll need for some delicious pork chops cooked with apple cider vinegar brine, so go out there and get cooking. 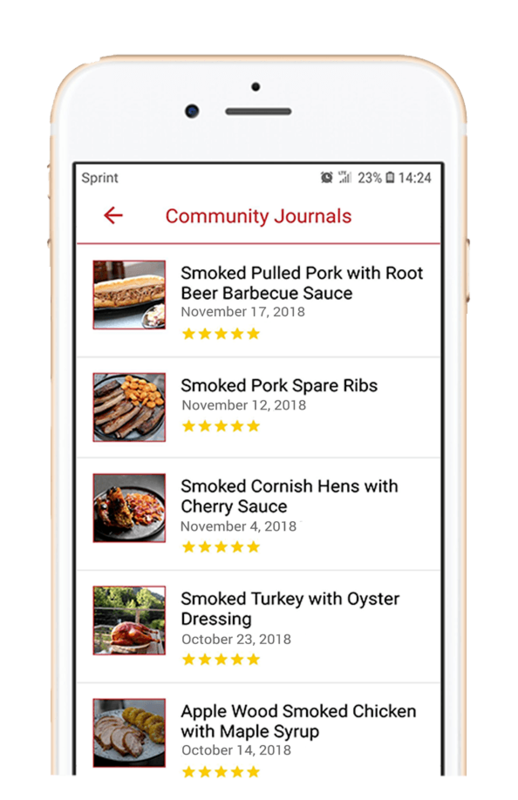 If you enjoyed this recipe, let us know in the comments. 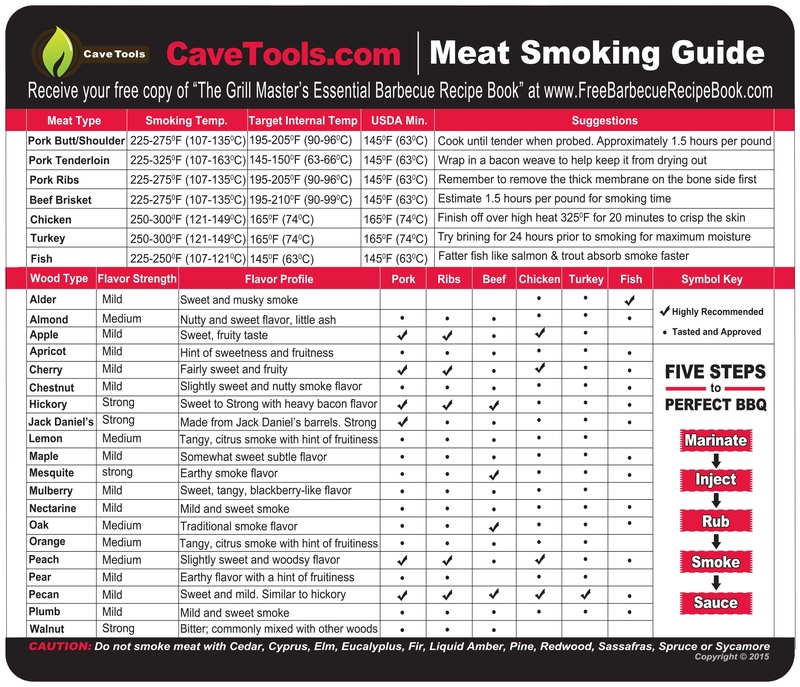 Share any of your favorite barbecuing tips and tricks, too. As always, remember to share this page with someone who could use a little extra pork chop love in their lives. You won't regret it once they share some leftovers with you. Do boneless pork chops cook faster than bone-in pork chops? You might be surprised to learn that bone-in pork chops actually cook faster than their boneless variety! This is because the bone acts like a heating rod, cooking the meat from the inside out in a way that is impossible without the bone. Plan for a few extra minutes of cooking time if you’re choosing boneless chops, and remember that thicker chops take longer to cook than thinner chops. Why should you brine pork chops? Pork chops and boneless skinless chicken breasts are the two cuts of meat we always recommend brining. Both of these cuts are very lean. 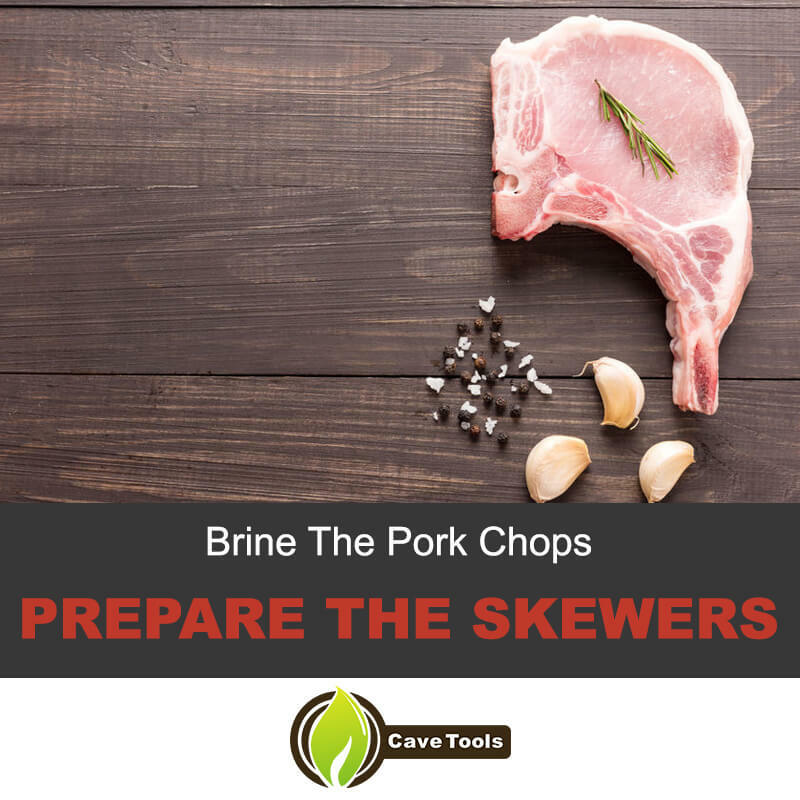 Although you’ll find a fat cap on most pork chops, there is very little intramuscular fat, so pork chops will dry out quickly without the brine. The brine denatures the proteins inside the meat, infusing them with juicy flavor and protecting them as they cook. The result is a juicier pork chop - every time. How do you grill thick pork chops? We love grilling thick pork chops! It may seem overwhelming at first, but they just need to be cooked longer and slower than thin pork chops. Because of this, we always start the chops on the indirect heat side of the grill to prevent them from burning before they’re cooked all the way through. 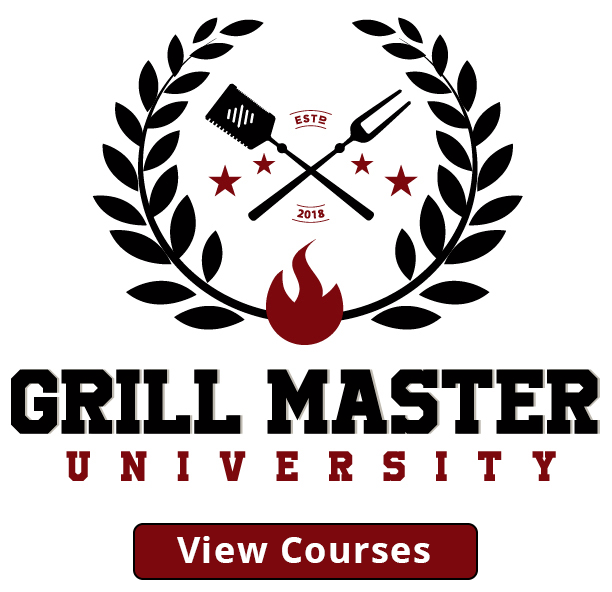 Then, once they reach 115 degrees F, place them on the hot side of the grill to get good grill marks and searing on each side. What temperature do you cook pork chops? 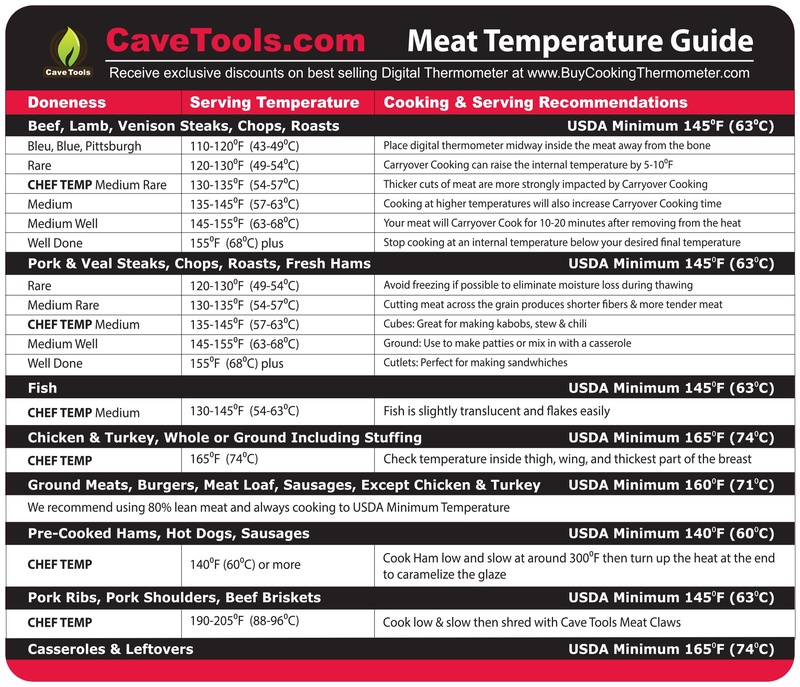 Prior to 2011, the USDA recommended a well-done cooking temperature of 165 degrees F. Today, we know this is no longer necessary and they have revised their cooking temperature guide for pork. They’re well cooked and juicy when they reach an internal temperature of 145 degrees F.
How do you serve a bone-in pork chop? This one is totally up to you. You can remove the bone on a cutting board (after the pork has rested for 5 to 15 minutes) and slice the pork into 1/4- to 1/2-inch pieces. Or, you can plop the whole bone-in pork chop on the place and let your guests cut into them like a steak. Just make sure to serve them with a knife!